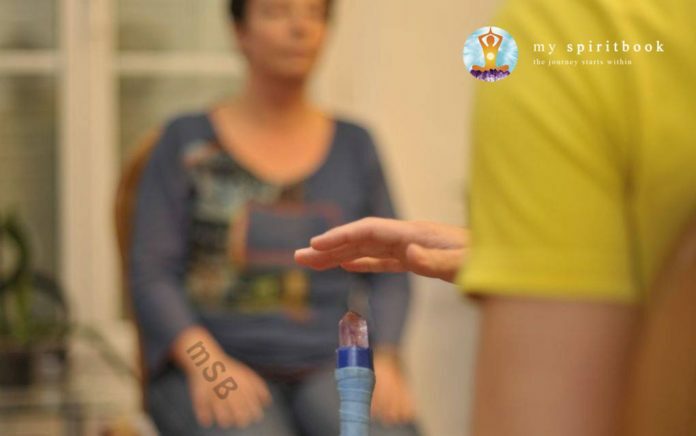 Crystal Healing is a holistic method, an alternative medicine technique where one perform healing through the mind of a crystal. During a typical crystal healing session, crystal healers guide their minds by using fine energies stored in crystals. I’ve been passionate about crystals since 2004. I went to a crystal shop and I bought a bunch of crystals not even knowing what they were good for. I heard about crystal healing from my Crystal Teacher. I was already practicing Reiki and discovering this new Universe. My mind was like a learning sponge so I was open to new healing methods. Since then, I see that more and more people open their minds to holistic methods and crystals. Just like I did, they buy crystals and crystal jewelries in a shop and learn about their healing properties from books or on a crystal healing course. The Crystal Healing we teach is a holistic healing technique has an effect on the completeness of the triad of body, mind and spirit. The universal mission of this healing method is to raise our spiritual level. The skills and techniques associated with our Crystal Healing method are simple and easy to learn. Adults and children can equally comprehend and incorporate this ancient form of healing into their lives. The best crystals to be used for the expansion of awareness are quartz. They are always ready, willing and able to perform a programmed task. Crystals are here to teach and serve us. Our Universe is made of energy. We are made of energy and everything around us too. We all have a different vibrational frequency, which varies depending on our health, emotions, etc. You are a crystal-pure energy that vibrates with the whole Universe. As we discussed it earlier, crystals, gems and minerals have been used and popular throughout the history of humankind. In the civilizations of Atlantis and Lemuria, crystals were the basic energy source as well as being used for healing, teaching and interstellar communication. Shamans utilized these healing stones in ceremonial rites to link man with his spirits. Alchemists worked with the hidden properties of crystals to unlock the secrets of the Earth. Crystal balls are still being used by psychics attempting to tap into the outer dimensions of time and space. Crystals are all around us. Some authorities believe that nearly thirty-three percent of the Earth’s surface is composed of this mineral. The number of crystals in shops and books are growing every day. Crystals are used in watches, appliances, radios, televisions, computers and telecommunication equipment. Two of the best known qualities contained in quartz are its piezoelectric effects and memory capacity in silicon chips. One of the most common forms of crystal healing is when the crystal therapist place different crystals near or on different areas of the body in a grid to stimulate energy. We can wear crystal jewelries and prepare a crystal elixir as well. By applying these techniques, we use the undirected vibrations of crystals which are static in space and time. Each cell of our bodies hold memories. The encoding of different crystals’ vibrations at a cellular level plays an important role on our Crystal Healing courses. After an encoding we don’t need to have the crystal in a physical form. We can meditate by invoking the crystal energy from our cells and recharge our chakras by placing our hands on our bodies. Therefore, the vibrations of crystals affect us directly. For 12 years now, I’ve been meditating with crystals, guiding meditations or doing crystal healing. I experience that people can relax easier through crystal energy. Those, who earlier could not meditate more than 5 minutes, were able to fully relax during a 30-minute meditation combined with crystal energy and it seemed like it lasted only 5 minutes. (See at Testimonials) The meditation exercises with crystals can develop a very strong state of mind. To read more about Crystal Healing Courses click here. Crystal Energy, How Does It Work? It’s so interesting that crystals emit different frequencies that can recharge living things. I’ve always found crystals to be beautiful, so it’s really cool that they can assist in healing. Does the light from crystals also help balance energy? My friend has an emotional disorder, so I’ve been looking for ways to help her.